Bibliography: Willis, Richard, in Dictionary of National Biography, 1885-1900, vol. 62. Reverendissimi domini domini Richardi Willis, Wintoniensis episcopi, bibliothecæ catalogus. 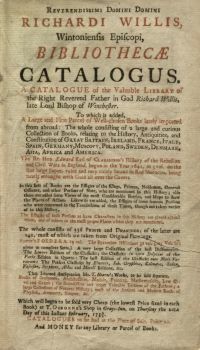 A catalogue of the valuable library of ... Richard Willis, late Lord Bishop of Winchester, to which is added, a large and fine parcel of well-chosen books lately imported ... Which will begin to be sold very cheap ... at T. Osborne’s shop in Grays-Inn, on Thursday the 20th day of this instant February, 1734/5, [London, 1735], VIII + 214 + p., in 8°.